I was perusing the cheese display at the grocery store recently and realized that goat cheese had taken over one entire section. Goat brie, goat Chevre, goat feta, goat queso, goat Jack. The only thing I haven't seen so far is goat parmesan. It wasn't always like this. In fact not very long ago - 20 or so years - you'd have been hard pressed to find any goat cheese or goat milk or goat yogurt in your average grocery store. Goat milk was an extremely niche product, sought out by some people who didn't tolerate cow's milk. Now it's going mainstream. Of course, goat products have been commonplace in many countries for a very long time. Twenty thousand year old cave art provides evidence that goats were important domestic animals thousands of years ago. Goats are pretty hardy and will eat all kinds of plants (as well as paper, trash and other undesirable items). Goat meat and dairy products continue to be important foods in North Africa, the Middle East, the Caribbean and Southeast Asia. In other areas, goats are raised as a source of wool. Goat milk products are growing in popularity in Western countries. Goat cheeses have unique flavors, and goat milk is still used as a cow's milk substitute. So the question is, how does goat milk stack up nutritionally speaking compared to cow's milk? Is nutrition a reason to switch? In fact, goat's milk is very similar to cow's milk. The chart below compares many of the key nutrients from milk. The goat's milk values are for the full fat version. As you can see nutritional values of the full fat milks are very similar. Goat's milk has slightly more fat, protein, calcium and potassium than whole cow's milk and slightly less lactose and zinc. None of the differences are enough to sway you to choose one over the other based on nutrition. One argument in favor of goat milk could be the absence of growth hormones. According to the USDA, growth hormones may not be used for goats. Antibiotics are only used to treat diseases, not as a general purpose growth promoter. Goat's milk has long been promoted as an alternative for people with cow's milk allergies for many years. However, goat's milk proteins are similar to those in cow's milk, and so can create the same allergic response. For this reason, allergy experts generally do not recommend goats milk as a substitute for people with a severe cow's milk allergy. Some people with less severe non-allergic intolerance to cow's milk may be able to drink goat's milk, but this is an individual decision. Some goat milk advocates claim that the fat particles in goat's milk are easier to digest, or that the lactose is better tolerated, making it easier on the digestive system. There's no actual research evidence for such claims. However if it works for you, that's all the evidence you need. There are a few major brands selling fresh goat's milk regionally or nationally. You can find them in the dairy case. Canned and evaporated goat's milk are also available. Goat's milk can be substituted for cow's milk in all recipes. It might affect flavor in foods like pudding or ice cream. With baked foods like cakes, or cream soups or sauces, the other seasonings can easily hide any milk flavors. Or course flavor ultimately determines whether we eat a food or not. People who are used to cow's milk might find the taste of goat's milk unusual. Goats can eat more variety of plants, and those plants can influence milk flavor. Goat's milk flavor may vary considerably depending on the source. It might also vary depending on the type of goat. National brands of goat milk available in major grocery stores will tend to maintain one flavor profile that customers can rely on. Flavor consistency can be achieved by feeding the goats a standard diet. 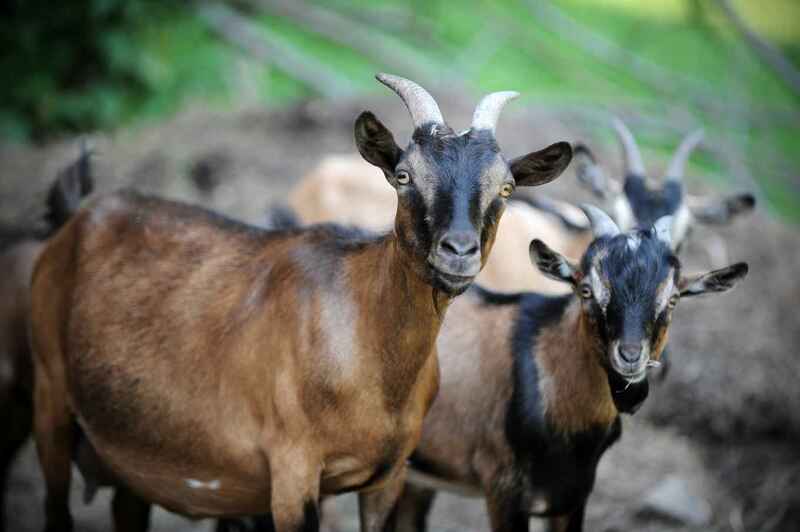 Goat milk from a local dairy may be more variable, depending on the goats' seasonal diet. As with any food, you can become accustomed to the flavor, at which point cow's milk might taste odd to you. If your first introduction to goat cheese was goat milk chevre, there's a good reason for that. Chevre is defined as cheese made from goat's milk. It's a soft cheese, easily spreadable, and the goat milk gives it a unique flavor. The award-winning (and pricey) Humboldt Fog goat cheese is a variation on this type of cheese. Compared to cream cheese, chevre higher protein, lower fat and lower calorie. Consider using it as a healthier spread on a bagel. Feta cheese made with goat's milk tends to be higher calorie and higher fat than cow's milk feta. It's also generally more expensive, but has a delicious creamy texture and unique flavor. Comparisons depend also on whether the feta is full fat or low fat, so it's hard to say all goat feta is higher fat than all cow's milk feta. Increasingly goat cheese makers are moving into other varieties, such as brie, camembert and cheddar-style harder aged cheeses. Because these are newer products, frequently made by small producers, nutrition facts might not be available. In general, goat cheeses will have similar nutritional profiles to the cow's milk versions. The reason to buy them is flavor, variety, or perhaps a cow's milk intolerance. Most goat milk cheeses are soft, and so don't grate so well. You can add crumbled cheese to salads or use as a topping for pasta. Spreadable goat cheese is great with crackers, bagels or wraps. Combine it with chopped cucumbers, some minced fresh mint or basil and minced red onion or scallions. Goat feta goes very well in a beet salad or with tomatoes and basil. Aged goat cheese is easier to slice, and can be used in sandwiches or even for cheeseburgers. The most puzzling thing I've ever heard about goat milk is that it's vegan. Honestly I have no idea where this idea came from. Vegans avoid all foods from animal sources. Last time I looked, goats were animals. Therefore no goat's milk for vegans. Perhaps this is a misunderstanding, and the claim refers to the goats themselves. If goats eat nothing from an animal, then they are vegan. Some people prefer that dairy foods come from animals that don't eat other animals. Fine. However, given goats' tendencies to eat whatever is in front of them, they may not be entirely vegan. So no, goat's milk is not considered a vegan food. But strangely the internet is loaded with recipes for vegan "goat" cheese. Which is a ridiculous term. Goats are animals, so any vegan cheese has no connection to goats. The recipes are likely using "goat" as a sort of descriptive term, as if you could replicate the creamy texture, nutrition and flavor of goat cheese with almonds or some other pulverized plant food. You can't. is author of "Feed Your Vegetarian Teen", writes about food and nutrition at Radio Nutrition and is co-host of the Walk Talk Nutrition podcast series. What's Up with All the Milks? How Much Added Sugar is in Yogurt?